Mortgage lenders appear to be holding credit standards stable despite increasing competition and declining demand and profit expectations. 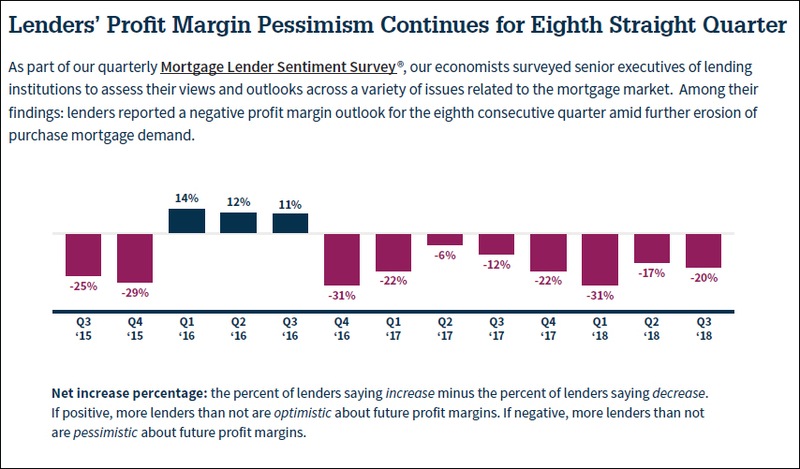 Fannie Mae's third quarter Mortgage Lender Sentiment Survey found an increasing number of respondents reporting a net negative profit margin outlook, the eighth consecutive quarter they have done so. The net negative was 20 percent compared to 17 percent in the second quarter and 12 percent in the third quarter of 2017, however it was lower than in either the fourth quarter of last year or the first quarter of this year when the net negatives were 22 percent and 31 percent respectively. The low expectations for profitability come amid further erosion of mortgage demand. Regardless of the loan type, GSE-eligible, non-GSE eligible, and government, the net shares of lenders reporting growth for the previous three months and expectations of growth for the next three months reached the lowest readings for any third quarter in the survey's five-year history. While the net of those reporting an increase in demand over the previous three months remained positive, ranging from 8.0 percent for government loans to the low to mid 20 percent range for GSE eligible and non-eligible loans, expectations for upcoming demand were all hovering in negative or near negative territory. Reported demand for refinance mortgages remained extremely negative but stable amid the higher interest rate environment. For the seventh consecutive quarter "competition from other lenders" was cited by survey participants as the top reason for their continued dismal margin outlook. Seventy-three percent named this as a reason while "consumer demand" jumped to be the second most important reason, reaching a survey high of 37 percent. Other reasons included "market trend changes" at 23 percent while 15 percent mentioned "staffing." The net shares of lenders reporting easing credit standards for GSE eligible and government loans for both the prior three months and the next three months are less than half the peak shares reached at the end of last year (Q4 2017). Additionally, the net easing share for non-GSE eligible loans over the prior three months appears to tick up from last quarter. Doug Duncan, senior vice president and chief economist at Fannie Mae said, "Lenders continued their bearish trend this quarter, as they note ongoing anemic refinance activity and the worst purchase mortgage demand for a third quarter in the survey's history. The profit outlook remains negative, with those lenders expecting decreased profit margins outweighing those anticipating increases for the eighth consecutive quarter. For the first time this year, consumer demand was one of the top two reasons for the downbeat profit outlook, cited by more than one-third of lenders-a record high. Meanwhile, the pace at which lenders are easing credit standards has slowed. The net shares of lenders reporting easing credit standards for GSE-eligible and government loans are less than half the peak shares reached at the end of last year. This may suggest the realization among lenders that combatting declining affordability by making it easier to obtain mortgages might not be the answer - or simply that there is little room for additional easing going forward." The Mortgage Lender Sentiment Survey by Fannie Mae polls senior executives of its lending institution customers on a quarterly basis to assess their views and outlook across varied dimensions of the mortgage market. The Fannie Mae third quarter 2018 Mortgage Lender Sentiment Survey was conducted between August 1, 2018 and August 13, 2018 by PSB in coordination with Fannie Mae. A total of 184 institutions reported, with 97 classified as smaller with origination volumes under $400 million. The remainder were classified as medium-sized ($400 million to $1.8 billion) and larger institutions with volume over $1.8 billion. Sixty-six were mortgage banks, 68 were depository institutions, and 39 were credit unions. Wow, I feel a LITTLE better about my pipeline after seeing "the worst purchase mortgage demand for a 3rd quarter in the survey's history"! Not a lot better, but a little, at least.